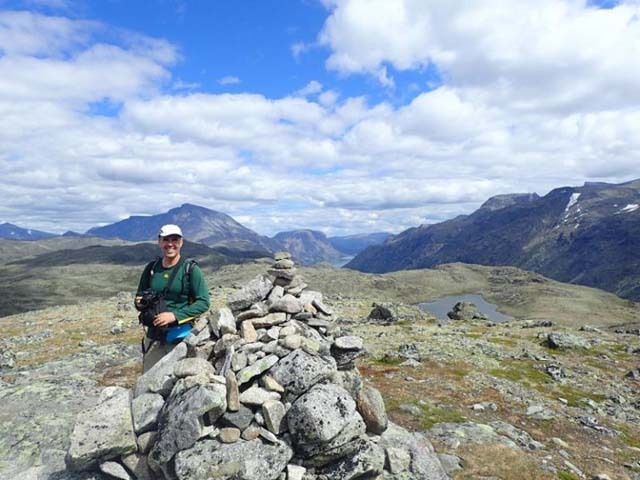 Bob from the Nature Travels team tried out the guided Hiking Besseggen and the Jotunheimen National Park tour in August 2018, beginning at Gjendesheim and ending at Fondsbu. It’s not often that such spectacular natural areas can be accessed so conveniently, but travelling for this tour was a breeze. Arriving at Oslo Gardermoen airport, I boarded the direct bus (which is included in the price of the tour for guests on this trip) and a few hours later found myself disembarking into the dusky evening light at Gjendesheim, where we would spend our first night before starting our hike next day. After a hearty meal of salmon in the restaurant and a first meeting with our guide, Glenn, we retired to our rooms, ready to make an early start for information meeting the next morning (a slight change from the normal itinerary, which has information meeting on this evening). After breakfast, the cabin host at Gjendesheim gave us an overview of these historic mountain cabins, which have been welcoming hikers to the area for 140 years. 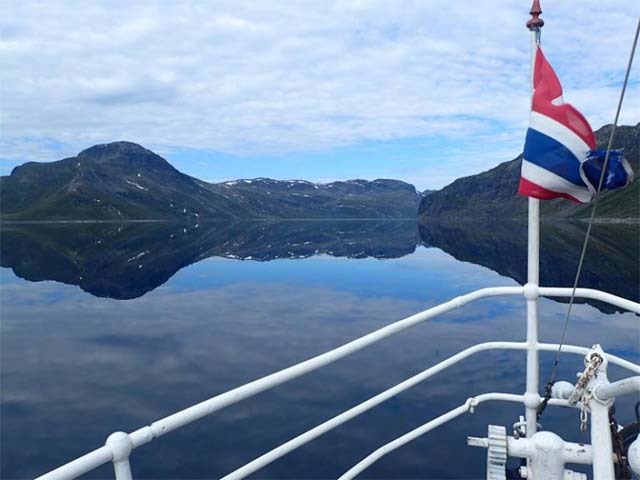 The cabins take their name from local mountain man and philospher Jo Gjende, whose cabin can be seen on a small island just across the water. Then it was time to start our hike. We were issued with labels for our luggage, which would be taken by boat to Memurubu, the cabins we would be hiking to today. We carried the bags down to the jetty before taking to the trail. 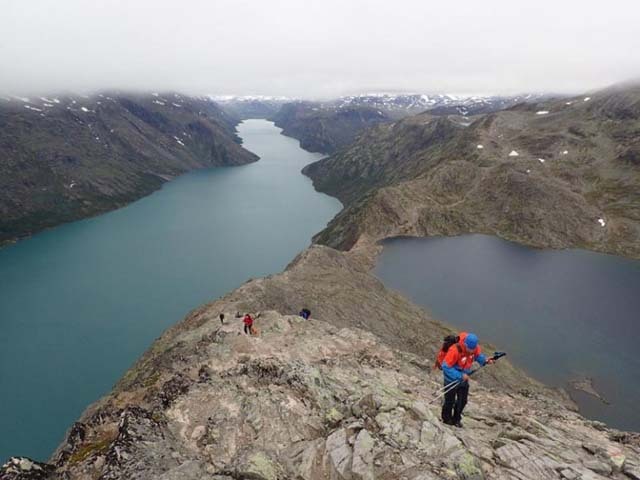 Today we would be hiking the famous Besseggen Ridge, a distance of around 13km with a climb of 1100m. After a while, the climb became steeper, and we stopped to don rain jackets as it started to rain. Care is needed on these sections, especially when wet, as the rocks can be slippy, but the trail is excellently marked and of course Glenn wasn’t going to leave anyone behind! This was the cloudiest day of the hike, and once on the top of the ridge, the full views eluded us. But it was still wonderful to be up, with mountain vistas opening up for just a few tantalising seconds at a time as the clouds blew through, giving us a taste for things to come. The walk down is spectacular, if slightly alarming. The trail is narrow and rocky, with steep drops on both sides, and caution is of course required, but this is a beautiful stretch with amazing views on either side. If doing the hike in the other direction, coming up the hill is apparently a little less vertiginous. 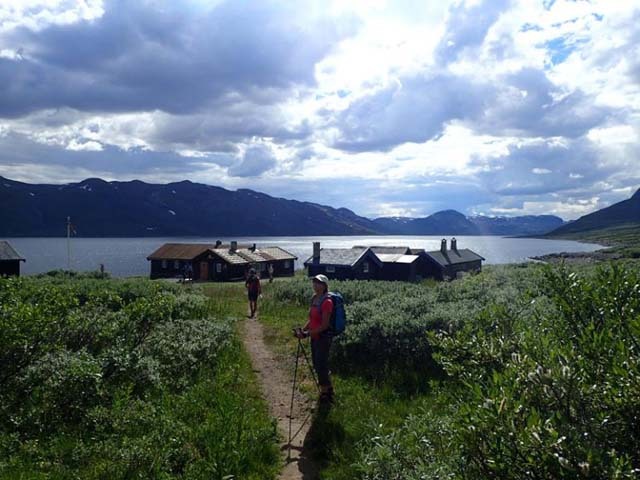 And the Norwegians certainly weren’t fazed – we met a number of local families hiking the trail even with young children and with their dogs bounding confidently up the hill! Tired but exhilarated by our first day on the hills, we arrived at the cabins at Memurubu. 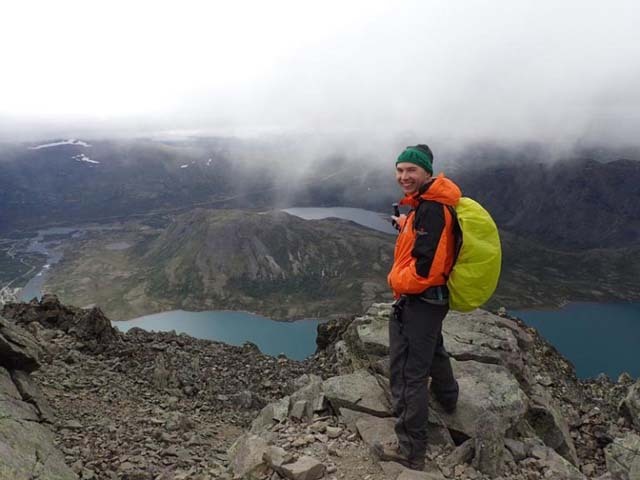 Being more used to hiking in the Swedish mountains than in Norway, I wasn’t expected such high-standard accommodation (relatively speaking, of course – don’t expect the Ritz!) this night, but apart from having a bunk bed, my room at Memurubu felt more like a hotel than a hiking hostel. This ensured I had no excuse to be tired for the next day’s hike! Next morning, the grey clouds of the day before had cleared and we awoke to clear blue skies overhead. 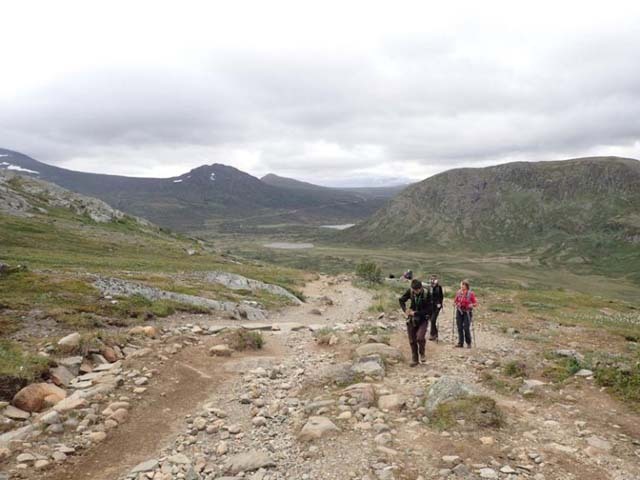 Today would take us along the Bukkelagret Ridge and over to the cabins at Gjendebu, a distance of around 9.5km with an ascent of approx. 700m. The Besseggen Ridge is undoubtedly a superb walk, justly deserving of its reputation as one of Norway’s most beautiful day hikes. But actually I found the scenery this day even more beautiful – thanks certainly in part to the glorious sunshine and clear skies, but also because we suddenly had the mountains to ourselves and it felt like we were really getting into the adventure. We began by crossing the river and taking a steep path to get up onto the ridge, affording great views back down the lake and down onto Memurubu. Further on, an absolutely stunning view opened up of the Memurudalen valley, which ranks high among the most beautiful valleys I’ve ever seen. The trail wouldn’t be taking us this way, but I was already yearning to come back and explore more! Scenically, this was an incredibly varied day. As the trail levelled out and we hiked along the high plateau, I could easily have imagined myself in Scotland. But our first sighting of reindeer put paid to any Highland illusions – we were most definitely in Norway! One of the many things I learned from our guide Glenn during this trip (which also included discovering our shared passion for 70s heavy rock music!) 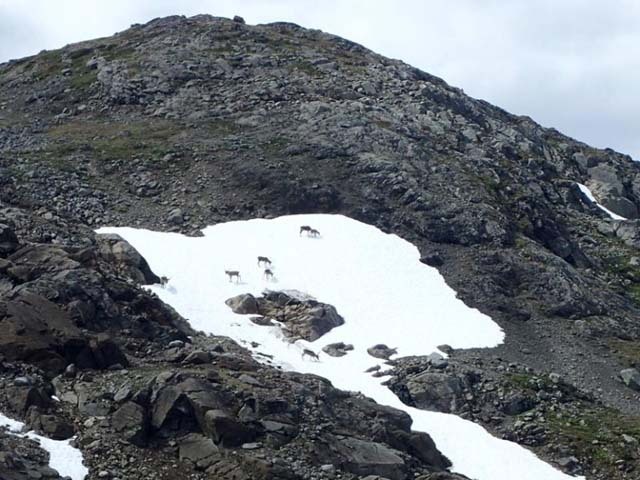 was that reindeer use the patches of snow – of which there were far fewer this year, as it was a summer of record hot weather – to cool down and also escape from parasites and flies, and so they are often to be found congregating on remaining areas of snow cover in the summer. What better way to enjoy a glorious sunny day in the mountains than with lunch by a lake and a paddle. While we cooled our toes in the icy water, Glenn continued his series of tales on the history and cultural heritage of the area – this is a real feature of the tour, and during the trip you’ll hear tales of local characters from the region’s history from when it was a postal route and how the British pioneered and popularised mountaineering and hillwalking in the area. But I won’t give more away here – you’ll just have to come on the tour and find out for yourself! It was just a well we’d had a nice rest at lunchtime, because we were in for a bit of a shock for the afternoon stretch of the hike. 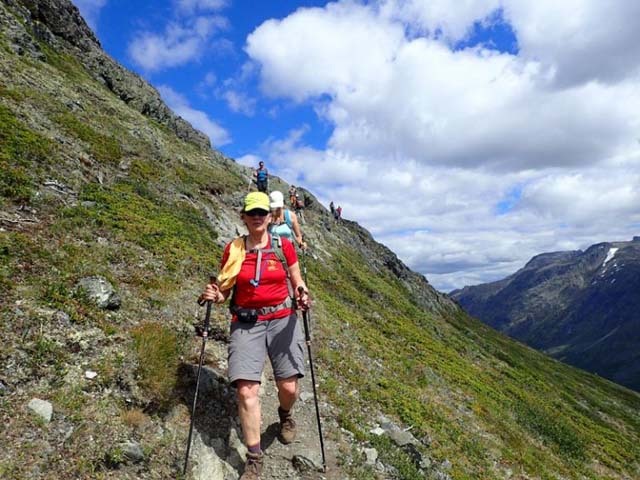 There is an expression – “Norwegian Easy” – which refers to the Norwegians’ ability to take any outdoor challenge in their stride and their corresponding tendency to underestimate how lesser mortals will find the same challenges! 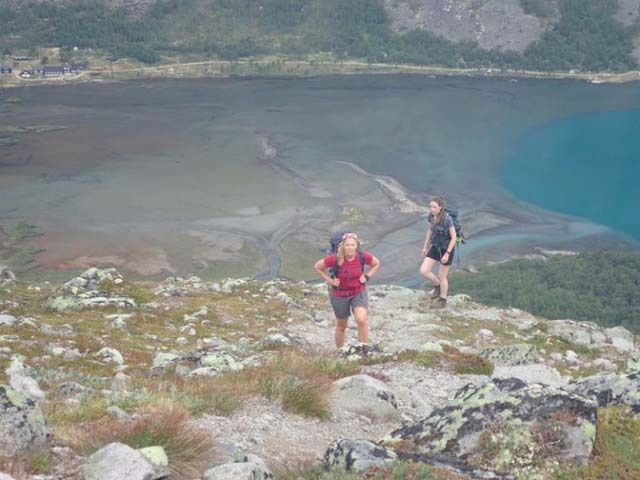 The path headed downwards and we were rewarded with postcard-perfect views of Lake Gjende, with its waters an almost an impossible blue thanks to the glacial waters pouring into it from the mountains. We’d been told this last part was “a bit steep”, so we were expecting a rapid descent. But…. This section is great fun – once you’re down you’ll look back up with a smile. 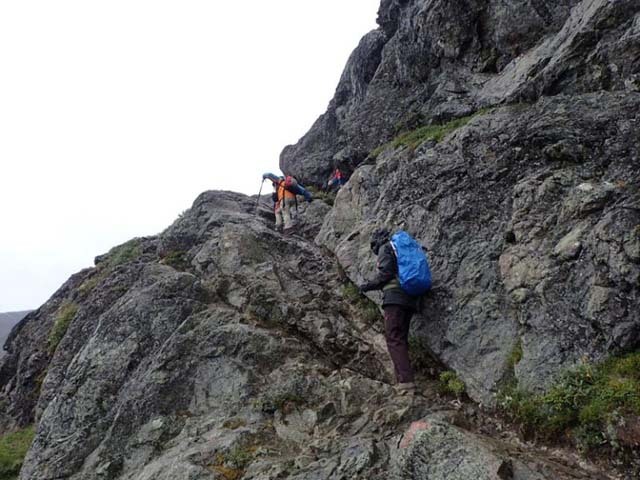 It begins with a narrow traverse and then just when you’re thinking, “Well, this isn’t too bad”, you get to the good bit – thoughtfully, chains have been attached to the rocks to help you lower yourself down the steepest parts, and you’ll certainly need them, especially if it’s wet. There are no pictures from this section, as both hands were needed at all times! If you’re doing the route in the other direction, this part will be a long, tiring and unforgiving climb. But going uphill has the advantage at least of being less hair-raising! Finally we were down and left just with the flat walk along the lakeside. The cabins at Gjendebu are some of the most interesting on the route, and we arrived tired and sticky but in good spirits. After dinner, there was an evening of stories of local farm girl Gjendine, who inspired the composer Grieg, which were made particularly atmospheric by being told in Gjendine’s actual cabin. A slice of modern civilisation intruded on us later in the evening, but considering it was the semi-finals of the World Cup, this can be forgiven. By popular request (particularly from the French and Belgian members of our group), a TV was rigged up in reception to watch the match! For the standard itinerary, guests would normally stay an extra night here and have a day for rest or day hikes in the area, for which there are some wonderful possibilities. There was no rest for us, though – we were pressing on to Torfinnsbu! Yesterday had been a day of dramatic, high views. 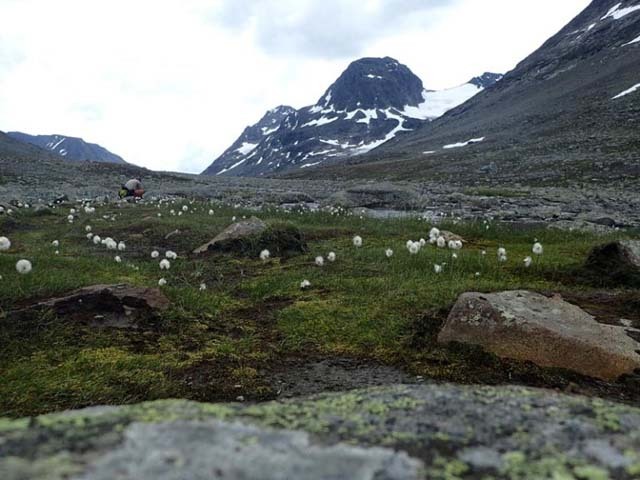 Today would be very different – taking a hike through the wide, glacial valley of Svartdalen of around 14km to the cabins at Torfinnsbu. 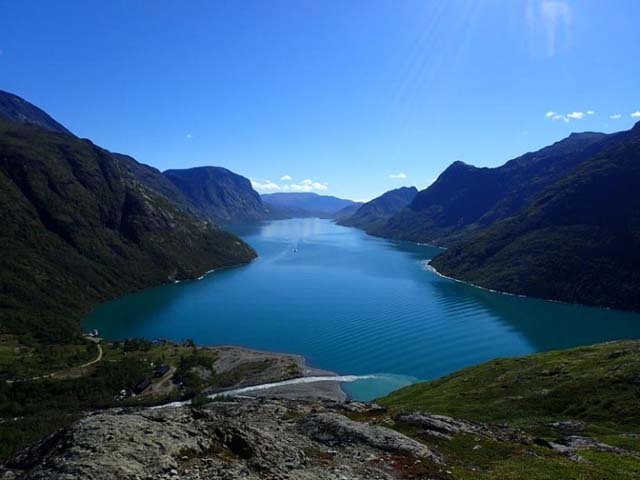 Which isn’t to say there wouldn’t be any climbing involved (this is Norway after all). We began the day with a flat walk but were soon doing a steep climb up a rocky path to reach the valley – this day ascends around 570m in total. Once up into the valley, the walking levels out and this is a long but lovely walk, with the hills rising majestically on both sides. It’s rocky underfoot, so your feet will be tired by the end of the day, but this day offered yet again a very different feel – a softer landscape in some ways, dotted with alpine flowers. From Glenn today we would hear stories of British mountaineer W.C. Slingsby and, prompted by the discovery of a copious deposit of lemming poo, lemmings! As the afternoon drew on, we dropped down out of the valley on a long, gentle descent towards the cabins at Torfinnsbu. 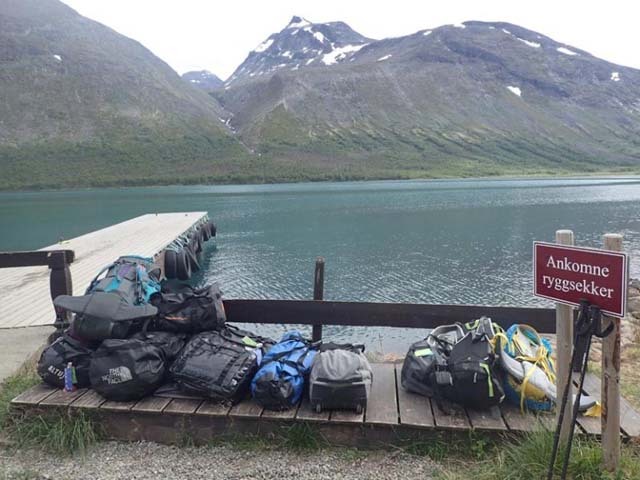 Due to an interesting tale of local politics, the jetty (to which our luggage had been delivered by boat as usual) is actually a fair distance away along the lake shore, so we’d certainly worked up an appetite by the time we’d got our bags and assembled back at the cabins. 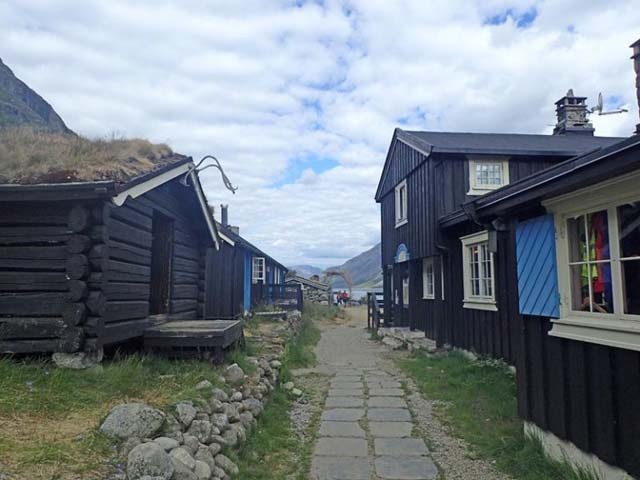 Torfinnsbu offers the simplest accommodation along the tour, with shared multi-person rooms and no inside running water. This would also be the only night we were preparing our own meals (using provisions provided from a self-service store based on an honesty system – if only such a wonderful system could be possible everywhere!). Although I had very much enjoyed the relative “luxury” of the accommodation on other nights, I confess Torfinnsbu was my favourite night of the trip, despite the fact that my backpack (in a freak logistical teething error of tour organisation which has since been ironed out!) had actually continued along the lake on the boat by mistake and I wouldn’t be seeing it until the next morning. The location here is very beautiful, offering a real feeling of wilderness. The cabins are atmospheric and the chance to cook a meal together was a great bonding experience and an opportunity to chat to other hikers staying at the cabins. Some of us took advantage of the proximity to the water to have a (very) short dip in the freezing waters. Lovely! And ideal for me, since my fresh clothes were far away in my main pack! We were the guinea-pigs for this trip – the first group to try the itinerary – and so our last day of hiking was a change from the normal arrangement. 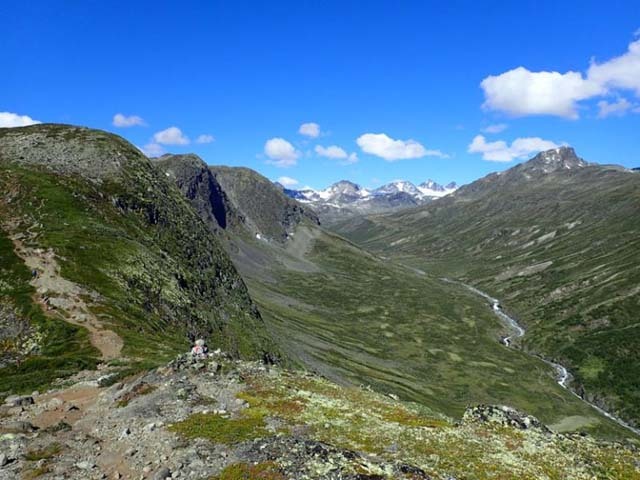 From Torfinnsbu, the trail continues with a hike along the side of the valley to reach the settlement of Eidsbugarden and the accommodation at Fondsbu. 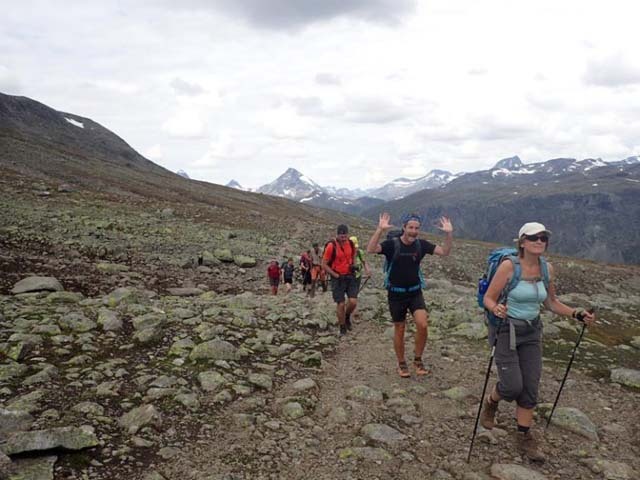 But at the time of our tour, that last part of the trail had not been completed and wasn’t walkable, so instead we took the boat along the lake for this day, followed by a shortish but spectacular hike from there up to the peak Utsikten. 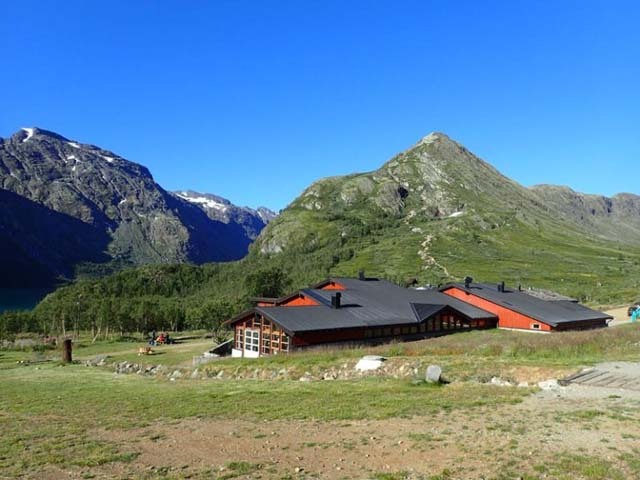 The hike up Utsikten is not a standard part of the tour, but extra night at Fondsbu can be added (at the start or end of the tour depending on which direction the route is being hiked) and this would be a great plan for an extra day. 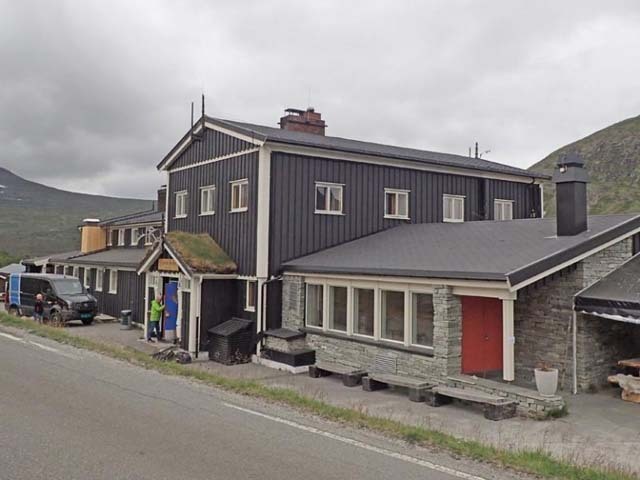 Our last night’s accommodation for the tour was at Fondsbu where in the evening, following lovely dinner, we took a short stroll to the historical cabin of Aasmund O. Vinje, owner of the first mountain cabin in Jotunheimen. His story is an emotive one, beautifully told by the charismatic host at Fondsbu, and made a wonderful end to our trip. 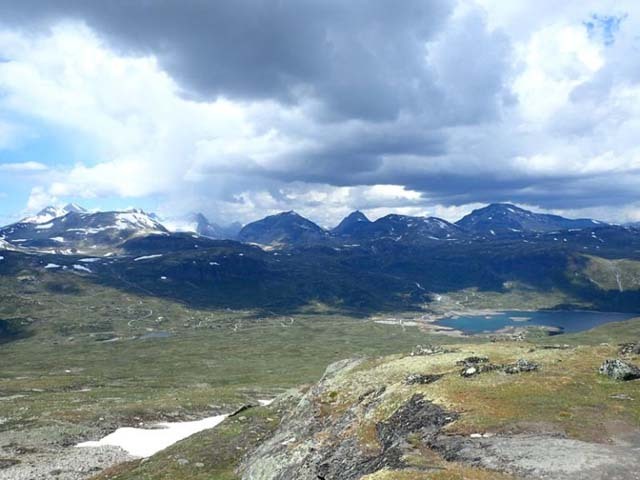 And so our hiking tour was over – some glorious days’ walking in the Norwegian mountains with spectacular and varied scenery and during which the weather gods had most certainly favoured us. 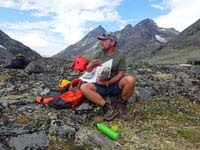 The provision of luggage transfer had made what could be a very demanding trip if carrying a full pack much more manageable (though still tiring at times) and left us extra energy to enjoy the beautiful views and soak up the many tales and stories. 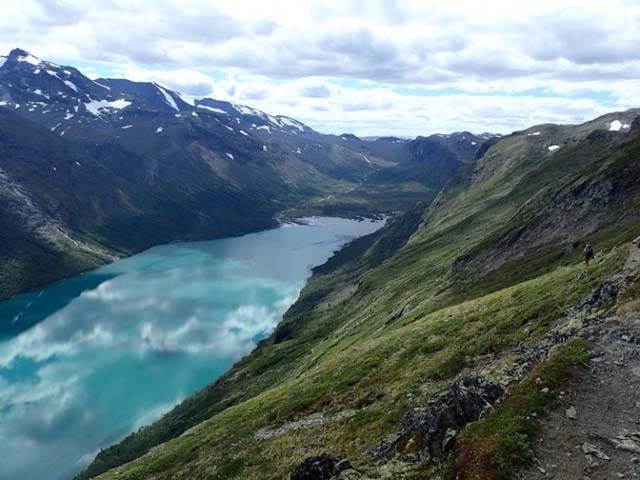 Hiking Besseggen and the Jotunheimen National Park is offered on fixed dates between June and August, with tours running either in the direction described above or in the opposite direction depending on dates. Bus travel to/from Oslo is included. 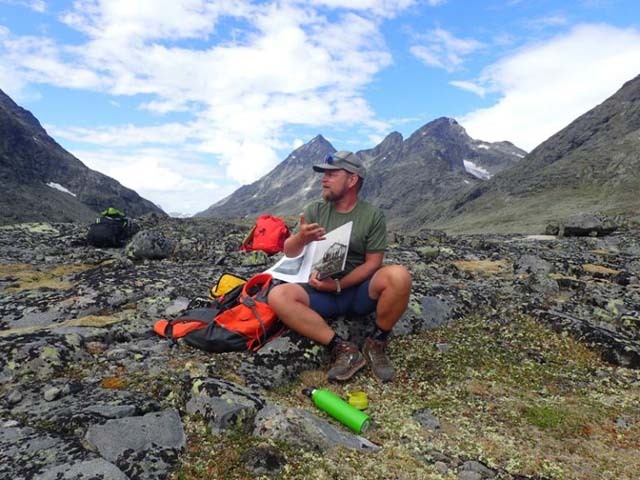 Those hungering for even more adventure can also add a day summit tour of the Uranostind Glacier and/or a hiking extension along the King’s Road as optional extras!